For animal lovers, the idea of traveling with their furry companions isn't an unusual one, particularly when that trip takes place in a car. Taking one's pet along for a ride may be normal for some, but often the right precautions are not taken to ensure that they are traveling in a way that ensures maximum pet safety. During a car trip, pets face many of the same dangers as humans, including the risk of ejection. Because they are unaware of the threat that some of their actions may cause, they also put themselves and everyone else at risk by simply behaving in a way that most dogs do while in a vehicle. For this reason, when traveling with pets in the car, a person will want to make every effort to reduce any potential sources of injury or harm. This is important regardless of whether a person is making a short trip to the park, or if they are traveling long distances on vacation. Vehicular pet safety begins even before a person or their pet sets foot or paw in the car. Not every pet behaves the same, and not every pet is a good candidate for traveling in a car. Pet owners should take their pet's temperament and behavior into consideration before driving with them. Some animals may be nervous or overly excitable when they get inside a vehicle. These types of animals may act in unexpected ways while the car is in motion. They may also vomit or have some other undesirable reactions due to motion sickness or out of fear. These types of pets should likely be left at home as they are not good candidates for car travel. If the animal must travel by car, a person should talk with a vet if the animal has car sickness as medication may help resolve the problem. Slowly letting frightened dogs familiarize themselves with the car before leaving on a road trip may also help alleviate some of their fear, as will very short trips driving in the vehicle. This, however, depends on what the animal is frightened of as it may be difficult to help an animal overcome a traumatic experience. If one's pet shows no signs of stress or fear, the right accessories will be needed to make traveling with the pet safe. Depending on the type of animal, a person will want to purchase either a travel crate or a harness. A travel crate, or carrier, is a good option for small dogs and cats and can give them a sense of security while the car is in motion. Crates also protect passengers by ensuring that the animal stays in one spot while driving to one's destination. Crates are also available for medium to large size dogs as well; however, these often require a larger vehicle due to size. Crates should have enough room inside for the animal to stand and turn comfortably. It should also be well-ventilated. 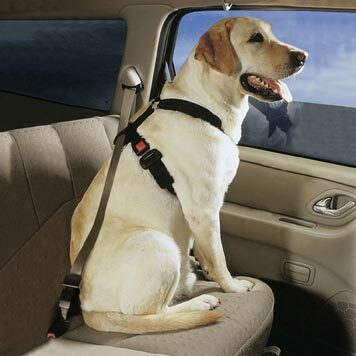 Medium and large animals are candidates for harnesses or dog car seats. These seats allow pet owners to buckle in their pets to keep them from moving freely about the car, or from being tossed around or ejected in the event of an accident. Crates and harnesses should be properly secured and set in a location that is away from direct sunlight. A car window shade may also be used to help reduce the amount of sun that reaches the animal. In addition to a crate or harness, pet owners will want to bring a portable bowl for water, a favorite blanket and a toy to help the animal stay occupied during longer trips. While a person will want to bring additional food depending on the nature of the car trip, the animal should be initially fed several hours before getting in the car to avoid any messy accidents. It may be fed again when the destination has been reached or a small amount may be given during a lengthy stop. Frequent stops should be made throughout long road trips so that the animal can stretch its legs. This is particularly true for dogs. People who drive with their pets may also consider having it micro-chipped in the event that it runs away or gets lost. A microchip can improve pet safety by increasing the animal's chances of being returned home if found. There are a number of things that should not be done while in traveling in the car with a pet. Pets should never be left in an unoccupied, parked car for any period-of-time. The interior of a vehicle can quickly become hot enough to cause heat stroke during the summer months. During cold weather conditions, the interior of a vehicle can quickly turn into an ice box and may cause an animal to freeze. Animals should not be left loose to roam the car at any point while it is in motion. Animals can interfere with the driver's ability to drive or concentrate. Dogs should not be allowed to hang their heads out of windows while the car is in motion as well. In some states this is also illegal. A dog with its head outside of a window is at risk of falling, which will not only injure or kill the animal, but can cause other vehicles to get into an accident. They may also injure themselves by stepping on the window control and closing their head, ears or other body part in the window. To avoid distraction, crates and dog harnesses should be placed in the back seat or holding area. When traveling with pets, taking steps to keep them safe is mandatory. Animals depend on their owners to take the right precautions to ensure their safety. From keeping them in temperature controlled vehicles to ensuring that they are properly secured while the car is in motion, pet owners not only protect their pets, but also themselves and their passengers. Pet safety takes little effort and will ultimately ensure a happy trip for all. Read the following links if you would like further information about traveling with pets by car.